Texwin's 3D product configurator accommodates the thousands of possible building configurations Texwin supports, reducing errors and increasing customer confidence. 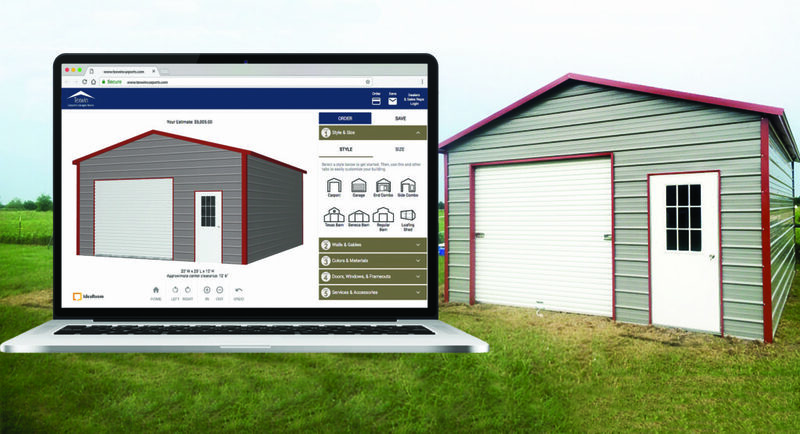 Texwin Inc., a Texas-based custom building company has affiliated with the IdeaRoom and will launch an online visual product configurator in August. Texwin decided to invest in the online configurator to address challenges related to continued growth during the past decade and significant growth in the past five years. Since Howard Winslow started the company literally in his garage in 1999, it has grown exponentially. Starting with building only a few hundred units nearly 20 years ago, Texwin will complete nearly 5,000 units in 2017. Employing more than 200 employees and installers, and with more than 100 retail dealers, the Winslow family still runs the company with three of their children, Mike, Ray, and Shelly. Recently, however, Texwin has been experiencing an increasing number of growing pains and recognized that it would need to invest heavily in both software and organizational changes to facilitate its continued growth. The three primary challenges facing Texwin were: 1) sales representatives were operating at near maximum capacity and order errors were increasingly becoming an issue, 2) customers were becoming more frustrated in the length of time to get through internal sales processes, and 3) consumers continue to drive demand for a more robust online shopping experience. Previously, Texwin sales representatives would need to create hand-drawn sketches to represent the customer’s ideas, then create diagrams for construction and manually determine the costs related to construction, just to get to the point where a customer quote and order could be produced. The process was laborious, leaving customers with a less-than-complete idea of what they were buying, and sales representatives were facing increasing inefficiencies and rising error rates. The company’s senior management recognized that these issues would continue to get worse and, if nothing was done, hamper future growth. In late 2016, after significant research, Texwin partnered with IdeaRoom, and after much collaboration, engaged IdeaRoom to develop their CPQ (configure, price, and quote) to meet their growing needs. “We are a company that grew up in our owner’s backyard, so technology was really not the priority in those early years, and as time marched on, we just continued to adapt manual systems to handle the workload,” says Gary Baker, general sales manager. “Our owners are quick to point out that we are a custom design building company, and because of our ability to literally design and build for each individual customer, the number of variables are daunting. With the online configurator from IdeaRoom, Texwin sales representatives and their customers can design buildings with state-of-the-art, life-like visuals while being guided by an intuitive and user-friendly menu. The package also includes business logic to help ensure building orders are fully supported, while producing instant and accurate price quotes for the end user. Customers are able to save images of desired building configurations, and Texwin is automatically notified of saved configurations so the company can continue to reach out to those customers, further increasing sales efficiency. The configurator also enables Texwin to satisfy the increasing customer demand for an online shopping experience. Although the configurator development was complex because of Texwin’s array of custom building solutions, IdeaRoom’s industry expertise streamlined the process. Investing with IdeaRoom and their CPQ service was part of Texwin’s initiative to improve operations and accommodate future growth. The company is furthering enhancements for their sales representatives and dealer network by adopting products from Salesforce and Smartsheet, and expect both of these products to be fully integrated by the end of the year. Five additional sales representatives were hired earlier this year, and the company has plans to add six additional sales representatives in 2018.